From its early beginnings in the 60s, blues-rock has influenced generations of guitarists, across a vast range of styles. Hard rock, Southern rock, metal, punk, indie, jam band, and even jazz fusion, all have proud roots tracing back to the extended jams and heavier, riff-oriented sounds of the early blues-rock pioneers. Having command of a blues-rock vocabulary, along with the requisite skills and techniques, is mandatory for any guitarist playing contemporary music, be it covers or originals. 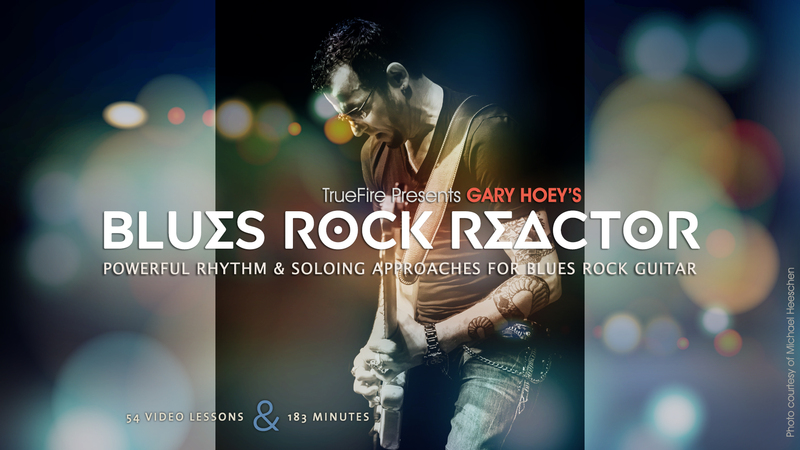 No one is better qualified than Gary Hoey to impart that vocabulary and skill set, which is why Blues Rock Reactor is a must-have for your course library. As writer, producer, and guitar player extraordinaire, Gary Hoeyâ? ?s pedigree is miles long. In addition to touring as a headline act, Hoey has toured and played with Brian May of Queen, Ted Nugent, Foreigner, Joe Satriani, The Doobie Brothers, Kenny Wayne Shepard, Eric Johnson, Steve Vai, Jeff Beck, Peter Frampton, Rick Derringer, Deep Purple, and Lita Ford. Weâ? ?re excited and very proud to welcome Gary to the family with his first TrueFire course, Blues Rock Reactor. Gary organized the course into three sections. In the first section, he passes on 10 of his favorite blues-rock licks. Youâ? ?ll start with the simplest, a Chuck-Berry-type riff, and then move on to more complex material that will help get your speed going and refine your technique. All of the licks are first demonstrated over jam tracks and then Gary breaks them down emphasizing the key techniques youâ? ?ll need command of: Berry Riff, Fourth Riff, King Style Bends, Vibrato Shake, Screaminâ?? Bends, Sixth & Fourth, Fast Fourths, Rake To The Shake, Up & Back Again, and Steady Trips. In the third and final section, Gary presents 6 Performances Studies featuring both rhythm and lead approaches. Gary will overview each study, demonstrate the rhythm and lead parts over a jam track, and then break the performances down for you emphasizing the key techniques and concepts being applied from the first two sections. All of the licks and performance studies are tabbed and notated for your practice, reference, and study purposes. You’ll also get Guitar Pro files so that you can play, loop and/or slow down the tab and notation as you work through the video guitar lessons. Plus, Gary generously includes all of the rhythm tracks for you to work with on your own. Grab your guitar and let’s stoke up your reactor with Gary Hoey!